For 7592 railroad grade crossing. For K Track. Required for each additional parallel track. 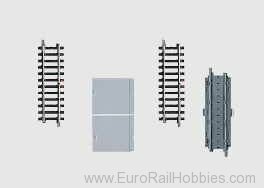 Contact track set: 3 straight tracks each 90 mm / 3-9/16“. Road section can be adjusted for spacing of 33 to 68 mm / 1-5/16“ to 2-11/16“ / track spacing of 64 to 99 mm/2-1/2“ to 3-7/8“.